Edible Communities, the national network of regional food magazines, has launched a Brooklyn edition published by the folks behind Edible East End, another Edible Communities publication covering the Hamptons and the North Fork. Of the new magazine, editor Gabrielle Langholtz writes: "Edible Brooklyn is much more than glam shots and restaurant reviews. This is a magazine with an opinion, one that advocates for sustaining agriculture, for relishing tradition, for seeking out taste experiences, and for pulling back the curtain on where Brooklyn's food comes from and how it got here." The premier issue include stories on smoked fish in Greenpoint, DUMBO's Jacques Torres Chocolates, and Gomberg Seltzer Works, one of the borough's last remaining seltzer delivery operations. Naturally, They Might Be Giants makes an appearance (this is a Brooklyn mag, after all) in an article cataloguing the contents of "The Brooklyn Fridge" of band member John Flansburgh. 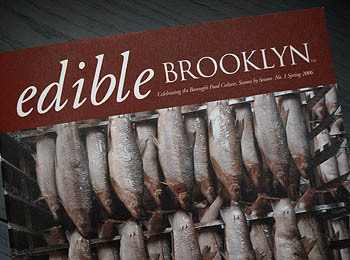 Edible Brooklyn, published quarterly, is distributed for free at Brooklyn shops and restaurants and is available by subscription for $28 annually. Edible Brooklyn is a great magazine. Great to see that you're reading my blog WhiteTrash BBQ. I talked about them on April 28th! Anybody remember a luncheonette around the corner from Shallow Jr. H.S. 127 in Bensonhurst/Boro Park that served an incredible sandwich called the Frank Special? It was a split hot dog (and my memory is not the greatest, which is why I'm inquiring) on, I think, a kaiser roll topped with french fried potatoes. Now, I'm not sure if it was served with mustard or ketchup or both. If anyone remembers, please let me know. Fantastic idea. I wish I had a similar resource for the area in which I live. Then again, I'd probably chain myself to it and insist I try everything in each issue. Maybe it's better I don't have one after all! I like that it's not just a food magazine that shows recipes and pics of great looking food. More issues and opinion makes it much more appealing. A new book collects the work of the renowned designer. Pop this juicer on top of your glass for a squeeze of citrus. The filmmaker teams up with the champagne maker.